Serie A (Lega Nazionale Professionisti Serie A) is the name of the top Italian football league and has existed since 1898 and since 1929 as structured today. Since 1961, the winner gets the trophy called Coppa Campioni d'Italia. When the league was established it included 18 clubs, but since when it has decreased and expanded many times: from 16 as minimum to 21 clubs as maximum (since the 2004-2005 season, 20 clubs has been included). Today the division is also referred to Lega Serie A. The Italian Serie A was inaugurated already in 1898, but for some more than two decades the competition was divided into regional groups. During the period 1922-1929 different arrangement was tried until several interregional divisions was merging into one. At this time was also Serie B, the second highest division inaugurated. In 1964, the league became the Lega Serie A when the Lega Calcio was founded in replace of Italian Federal Football Association. Scudetti, which is Italian for “little shield” has since the 1924 been a shield (i.e. logo) been awarded to the winner to wear on the shirt. The team winning the Serie A is often referred to “winning the scudetto”. Serie A is the top level of the Italian football league system. The second division was founded in 1929 and is known as Serie B. Some years later a third tier, Serie C was founded. An overview of the current national league system is presented in the table below. Below the third tier the league is played on semi- or non-professional levels with regional divisions. The top three teams in Seria A are qualified for the Champions League (one place also goes to the winner of the Coppa Italia) and the teams that are placed 3-6 will also get the chance to play in European Cups. Since the season 2006-2007 the three teams placed at the bottom of the table (places 18-20) have been relegated to Serie B. In the 2005-2006 season only two teams were relegated. Before that two teams (places 18-20) were relegated directly and two teams (places 17-18) would go to playoffs consisting of a two-legged game in which the winner avoided relegation. Statistics of all Italian clubs that have won the top division more than once, concerning the period 1929-2018. Also, Cagliare, Casale, Novese, Hellas Verona and Sampdoria have won the Seria A. Notice that Juventus won the league in season 2004-05, but the title was later revoked. Statistics of the Italian clubs that have participated over 50 times in Serie A during the period 1929-2017. Overview of the number of teams that have participated from season to season. Due to the World War II, no seasons were played during the period 1944-1945. The table shows the capacity of the teams participating in Serie A. San Siro, where both Internazionale and Milan plays, has the highest capacity with over 80,00 seats. The average capacity in the league is 39,410. The league's all-time leading goalscorer is Silvio Piola who played in Cagliari Calcio and who's career lasted from 1929 to 1952. In thís period he scored 274 times in Serie A. Next to Piola, Francesco Totti is the top goalscorer with 250 goals between 1992 and 2017. 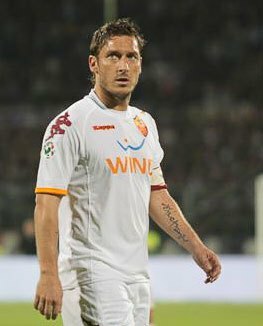 Francesco Totti in Roma uniform. Other notable goalscorer in the league are Gunnar Nordahl, José Altafini, Giuseppe Meazza, Antonio Di Natale and Roberto Baggio. They all scored over 200 times.